Welcome to Sycamore Carriage House! Bright and eclectic! Cozy space to lounge. View from the stairs. The spiral staircase leads up to the bedroom. 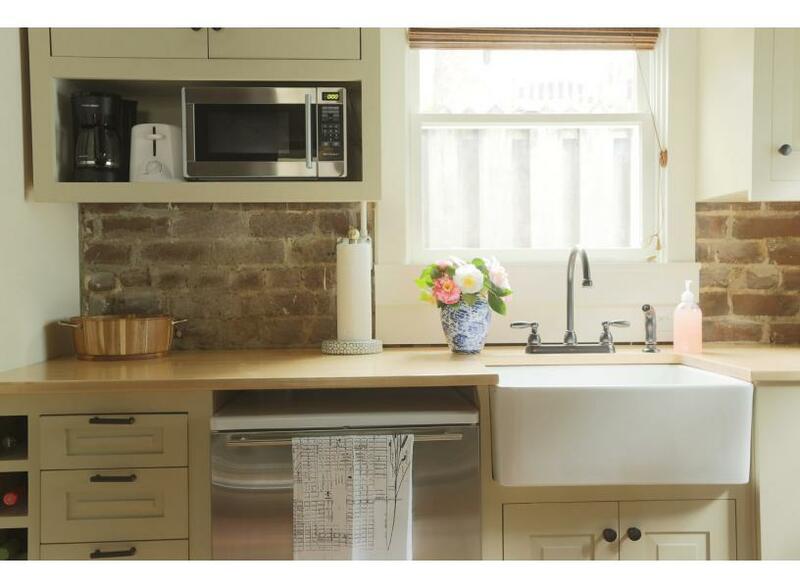 A beautiful farm house sink and bright cabinetry. The sweetest kitchen. The queen size bedroom upstairs. The back door to a small balcony. Lots of light gathers in the upstairs bedroom. 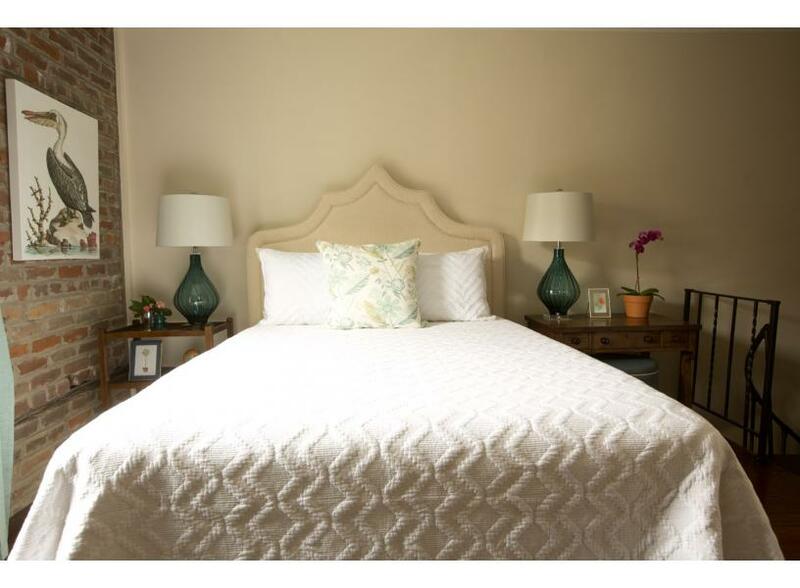 Chic bedding and decor. En suite upstairs with walk in shower. Small balcony off the bedroom overlooking the neighborhood. Built in 1875 on the lovely Jones Street, named “the prettiest street in America” by Southern Living Magazine, Sycamore Carriage House is tucked behind the giant Sycamore it gets it’s name from. With one bedroom and one full bath, this two-story carriage house is an ideal romantic getaway for two two Lucky guests. 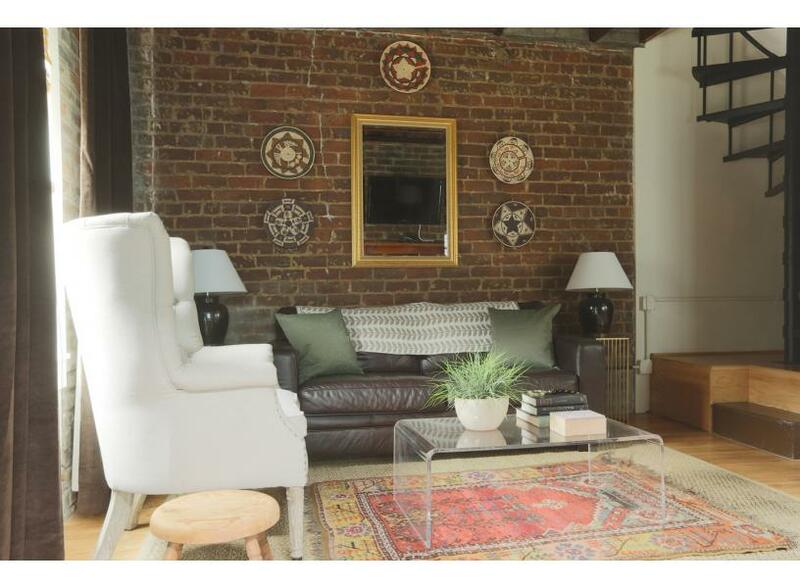 The living area is an eclectic mix of modern and vintage décor, anchored by a large ornamental hearth and leather sofa. The kitchenette microwave, mini fridge with freezer, appliances, plates and cutlery. Follow the spiral staircase up to the bedroom, where you’ll find a comfortable queen-size bed and decorative fireplace. 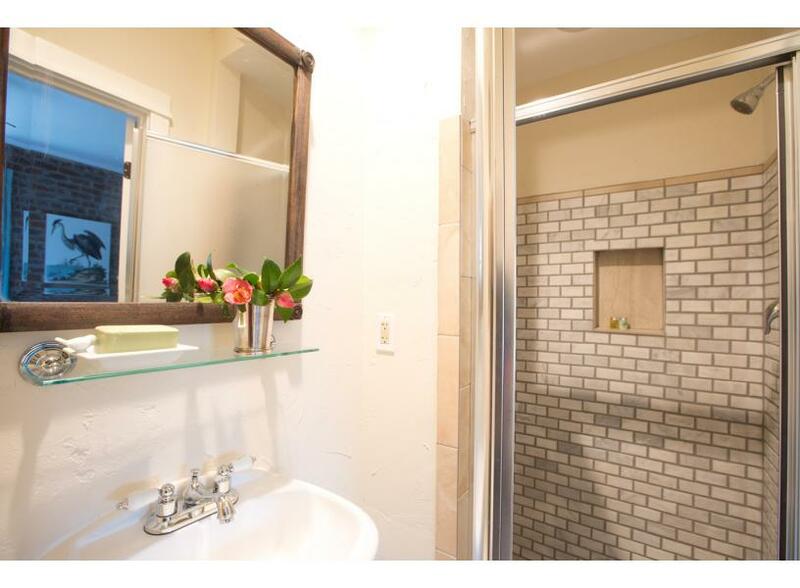 The ensuite bathroom has a tiled shower and pedestal sink. Watch the sunset from your private balcony before heading out to dinner at one of Savannah’s world-class restaurants. In the morning, a leisurely stroll down the cobblestones of Jones Street will bring you Clary’s Cafe, the setting for several breakfast scenes in Midnight in the Garden of Good and Evil. From there you’ll be just mere steps away from the Cathedral of St. John the Baptist, which underwent a major restoration to preserve their beautiful stained glass windows and architectural integrity. If you do bring a pet to this dog-friendly home, you'll be in a great location to walk over to Mother Matilda Beasley, the only dog park in the Historic District, just a couple of blocks away. I have to give this rental two reviews for multiple reasons. #1- in regards to this property being “pet friendly” I would give it 2/5 stars. There was no where for your pet to do their business other than walking down the street to find some “green space”. The poperty wasn’t private and a neighbor had their dog in our common space. The neighbors dog actually nipped our dog, causing our dog to be terrified of going outside. I would not come back with a pet! #2- if you are a young couple, single person, etc., the space would be for you. Unless you feel like going up and down a steep spiral staircase to use the restroom, I would find another property to rent. We came in knowing the space was going to be small and charming, but it was smaller than we even imagined. We also were hoping to have a washer and dryer since a laundry detergent packet was included (this information came from check in notes). Overall, it was a nice space but VERY tiny and not super comfortable. This was a good rental for 2 people, I would not recommend sharing this with anyone else, for 2 reasons. First, there would be no privacy for either couple/family and second, there is no air conditioning downstairs. I think sleeping downstairs would be very uncomfortable. It wasn’t the cleanest rental I’ve ever stayed in, but it was acceptable. I would encourage the company to seal both the entry and the balcony doors, there is a quarter inch open gap all the way around both of them. This probably explains the report of palmetto bugs from other reviews. We did not see any of them during our stay. The location is great and we appreciated not having to worry about a key, just the codes. The app could definitely make how to enter the property much more clear, but thankfully someone answered the phone at 9:30pm and got us the external entry code. Other notes for potential renters - the tv is useless, the picture comes across as static due to the lack of proper cables to transmit to the screen. This could be an issue if you’re stuck inside due to weather. But we didn’t miss it, we were out constantly. The location is great, we walked everywhere and street parking was easy to find. Last note - the kitchen is really only usable for coffee. There is only a mini-fridge, and one tiny ice cube tray. I definitely recommend bringing your own drinks with you as there is no place close by to stock up at. Nice little place. Good location if you are planning on walking a lot of places. The neighborhood was quiet. My only problem with the place was that the wifi didn't work and the TV reception/picture quality was poor. Also sone lamps were missing bulbs and therefore didn't work. Cute cottage in a nice neighborhood conveniently located to the riverfront. Great stay in Savannah. The rental was in a very convenient location and offered us easy access to everywhere we wanted to go. Place was quiet and clean and we enjoyed our stay. Quaint little place. The highlight was the level and availablilty of customer service. Amanda, in particular was on the ball and willing to go the extra mile to see to it our needs were satisfied. The carriage house was a great honeymoon location. 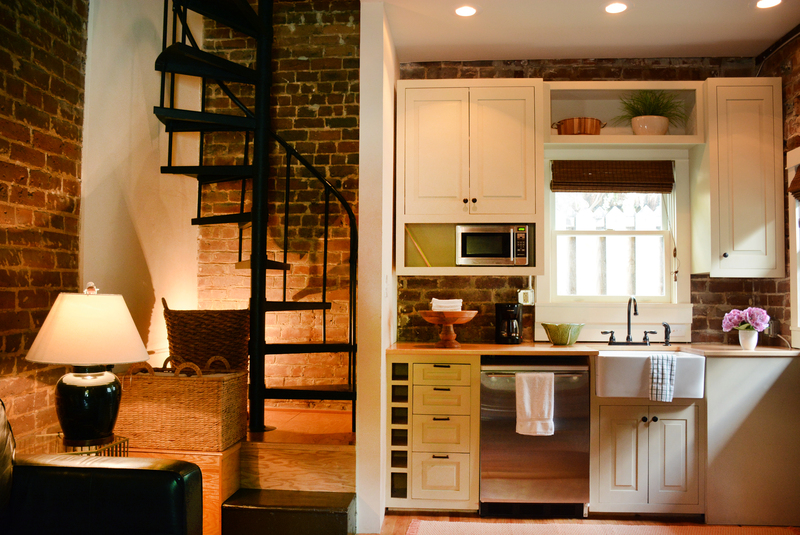 The narrow, winding staircase is not for all travelers, but the carriage house's character and its nearness to historic Savannah made it a romantic spot. On street parking was available nearby and the AC worked well. I would recommend this location. The Sycamore Carriage House was great! It is small but was perfect for our family of three. It was located in a great part of town and very close to the downtown and waterfront areas. It was full of historical charm and we had very little problem with parking. Savannah is a wonderful city with plenty of great food, shops and ghost hunting adventures. The owners were extremely helpful. I highly recommend The Sycamore Carriage House and Savannah!!! Really loved having the privacy of staying in the carriage house especially the feeling safe with the double keypad entries. Thanks again for choosing to book with Lucky Savannah, Meggan! The whole experience was easy and the stay was beyond awesome! The security of the home made us feel safe and sound and we had no issues at all getting in and out. The downstairs area was warm at times but the upstairs had enough air circulation to sleep and enjoy ourselves comfortably. The carriage house is absolutely gorgeous and had everything we needed for a fun week. Thank y'all for having us and we will definitely return! Jimmy, thank you again for choosing to book with Lucky Savannah. We're beyond pleased to hear that you enjoyed your time at Sycamore Carriage, and look forward to hosting you again soon! 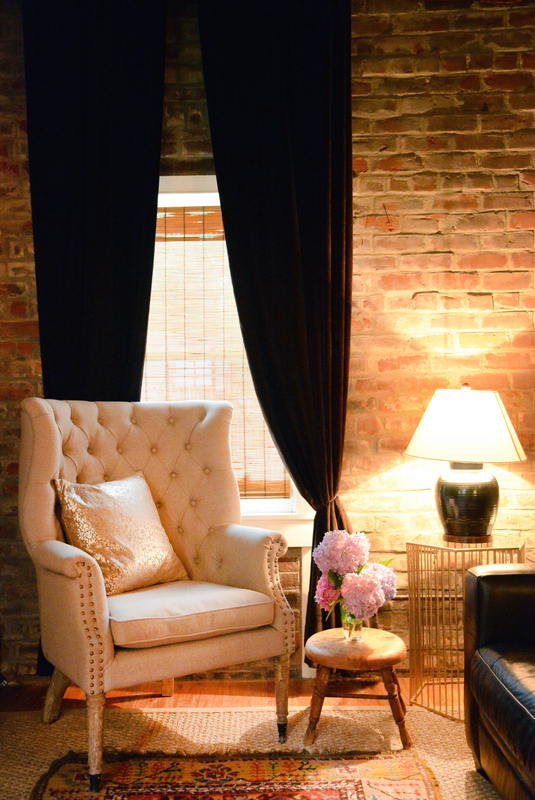 Our experience at Sycamore Carriage House was awesome. It is in a great location as described. The house itself was great. Beautiful and full of character as well as clean and maintained. At first we had trouble finding it but a quick call to the staff helped us locate it. The only trouble we had was with our dog and the spiral staircase. He had trouble using it at first but figured it out. I would definitely recommend this property for a quiet, relaxed stay close to most everything or within walking distance. Hey Jason! Thanks again for booking with Lucky Savannah. We're so happy to hear that you (and your pup) enjoyed Sycamore Carriage. See you again soon! 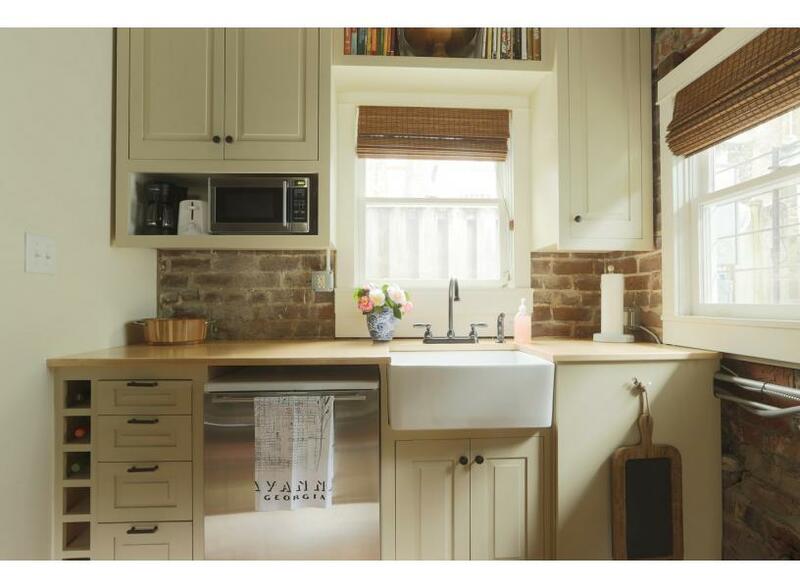 Sycamore Carriage house is cute and cozy. I wouldn't think it would sleep 4 very comfortably. No closets or hooks to hang clothes. The skinny spiral staircase to the bedroom is cute but hauling up a suitcase is a challenge. Do not book if you have sight issues, fear of heights or are larger in size. No oven or toaster oven. Only a hot plate for heating things. On the bright side, it is in a great location. One of the city's squares is one block away. It is the prettiest area in town. Uber service to get to restaurants and the river front area is cheap and easy. Street parking at the house was a breeze. There are no instructions about the dehumidifier. It keep the house from being damp, but needs to be emptied daily. Easy enough to do, but I spilled a lot of water the first time I emptied it. Also, very poor lighting in the living room and no working porch lights. Leslie, thank you again for choosing Lucky Savannah! We're so glad to hear that you had a great stay at Sycamore Carriage House and appreciate the constructive feedback. Please know you're privy to a Return Guest discount next time you stay with us! At Home in Historic Savannah! 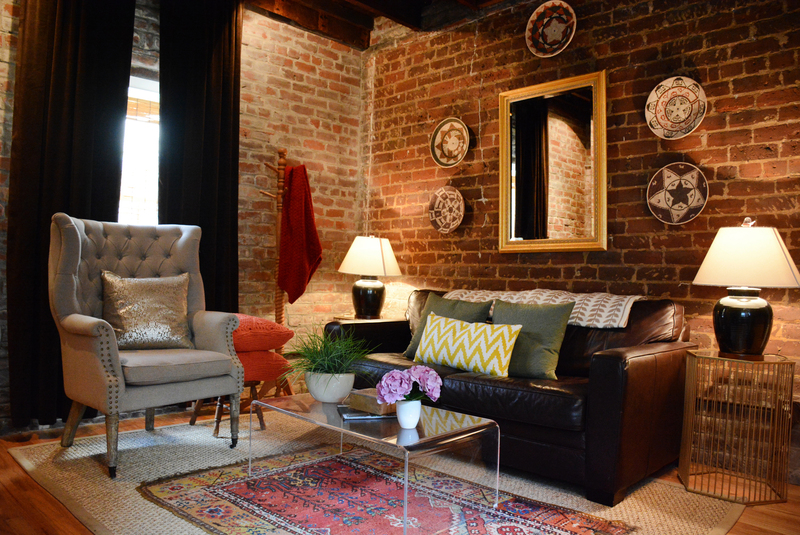 We absolutely adored this cozy and stylish space! As a finale to our drive cross country we spent the last four days of our honeymoon exploring historic Savannah. This apartment is in a very central location, just off what all of the tours proclaimed the most beautiful street in the city. We felt like natives coming home to our little lane each night. It had everything we needed to relax and reboot after a long day of walking the charming streets downtown. Alexander, thank you for choosing Lucky Savannah! We're so happy to hear that you enjoyed Sycamore Carriage House. Guests surely do experience the city like a traveler, not a tourist when staying here. We hope to host you again soon! Well appointed carriage house. 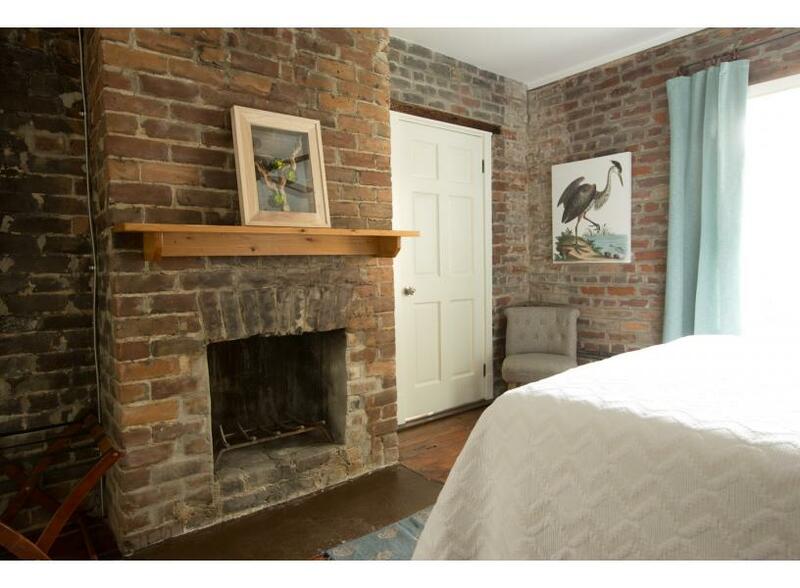 Prime location - easy walk to all of Savannah historic sites, restaurants, galleries, etc. quiet and private. Had dog - beautiful squares nearby for walks. Property management folks very helpful with local suggestions/activities. Arrival and departure logistics flawless. Thanks again for staying with us, David! We hope to host you and your lucky pup again soon. Hi Arthur! Thank you for choosing Lucky Savannah! We are thrilled that you enjoyed your stay with us and hope to see you again soon! Cozy carriage home, located on my favorite street in Savannah near the lovely Whitefield Square, is situated in a quiet, residential area. Savannah is breathtakingly beautiful in the spring with the azaleas, dogwoods, and wisterias in bloom. Strolling down Jones Street and around the squares will transform any visitor to a true Savannian! Looking forward to our return. My daughter and I who are vegans were pleasantly surprised to find one of the best vegan restaurants we've ever been to just around the corner. The location is super convenient to all the sites. Parking was easy but you do need to be careful of the street sweeping rules. A little drop leaf table where you could sit and eat would be a nice addition. It is a little tricky to find so note the address carefully. It is not located on the main street but the alley behind that has the same name. It's mentioned in the instructions but still a little confusing when tired after a long drive. Hi Lisa! Thank you for choosing Lucky Savannah to host you in the Hostess City of the South. We are so glad that you enjoyed the location of the rental and that you were near amenities that were of value to you! We hope to see you again soon! We were very pleased with our stay here! It was very clean and cozy. A bit difficult to heat the downstairs area but that would not deter us from choosing this property in the future. The booking process was easy and the contact person was responsive and quick to respond. Don't hesitate in choosing this gem. 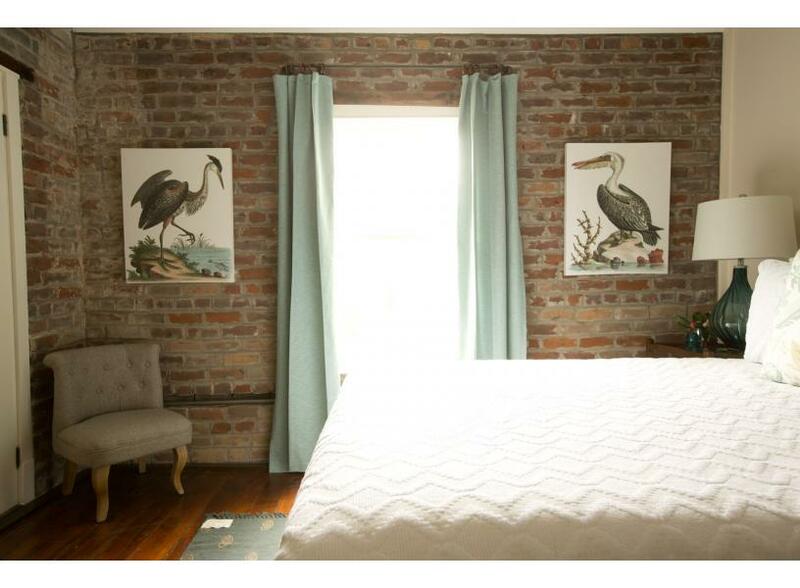 The Sycamore Carriage House was an absolutely perfect homemade for our first time in Savannah. Convenient to basically everything in the historic district, my fiancé and I had an amazing time walking the beautiful streets, drinking in Savannah, and catching our breath in this charming property. Staying at the Sycamore house was amazing. My husband and I had a hard time finding the place it took us almost 2 hours driving around the block to find, but also because we did arrive in the evening. Also getting into the house the code provided didnt work but thankfully we called customer service and they immediately fixed the issue. Other than that the house was lovely, has a very nice historical feed with a touch of modern. The bed was so comfortable, the bathroom was clean and fully updated. The staircase was a little narrow and its spiral, but it was a great feature to us. Not sure how comfortable everyone else would be with it because of the climb and narrowness of it. The house was in a great location very close to river street. We went to Tybee island which was about a 30-45m drive. Great area for walking, we stumbled upon Forsyth park, within walking distance from the house. The park is amazing!! (wish there was a stove of some sort something conventional like a griddle) We would definitely stay at the house again, after staying in the house we would consider moving to Savannah. I can't say enough good things about the Lucky Savannah staff and the home was so cute and cozy. Corey provided above and beyond service by trying to help me with a very difficult situation. Cannot thank you enough for everything that you helped with! I will always refer my friends and family to use Lucky Savannah when visiting!! This carriage house was perfect for us...cozy, charming and the location is great!!! Great value for the price, I would stay here over a hotel any day!!!! 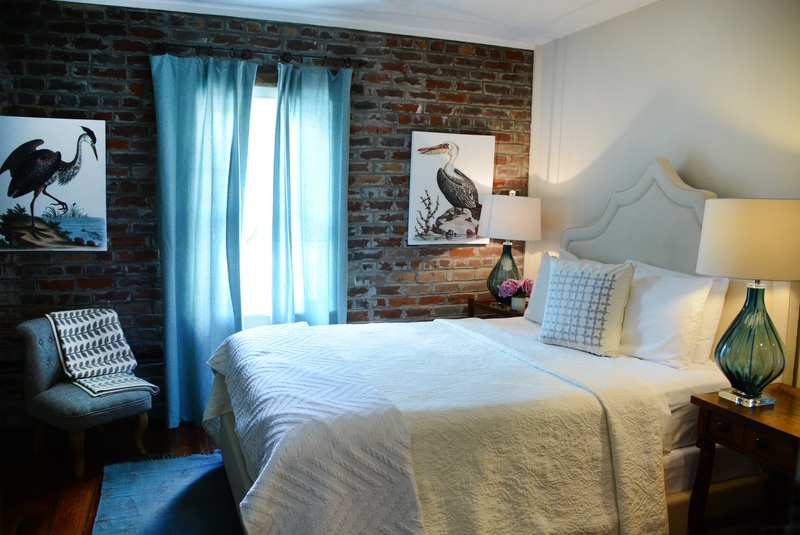 Cannot say enough lovely things about our charming carriage house in Savannah. It was so nice not having to stress about checking in as we took our time arriving in Savannah, stopping for dinner at Chive and walking our dog around town. The Carriage House is adorable! Perfectly decorated, supplied with everything you need and so cozy! VERY CLEAN. The location was sensational- we never drove our car for the rest of our time in Savannah, as we were walking distance to every restaurant, yoga studio, coffee shop, field, the shops of Broughton and the River Walk. I am a runner and was able to enjoy safe miles of running every morning. I am recommending Lucky Savannah t all my friends and family- couldn't imagine being in a hotel after this incredible experience. I fell in love with this condo and wanted to bring it back to California with me. Everything from booking to arrival and departure was easy. This condo is great for younger couples, only because you have to get your luggage up a spiral staircase. Overall, the house is very cute and well-appointed. The bed was comfy and Lucky Savannah did a great job of answering any questions and ensuring it was clean and ready for our stay. They also have a really handy phone app if you're an over-planner for vacations like I am. The house is pretty tiny, and the staircase is narrow so I would definitely only recommend if you're comfortable navigating difficult stairs. The house is about a half mile walk to some attractions and about a mile to River Street/Broughton so it's a little out of the way but enjoys the benefit of being quiet and is proximate to Jones St. and several beautiful squares. Overall it was a cozy and pleasant stay, but the size of the unit, not having an actual counter in the bathroom, etc. does take a little adjustment. This vacation rental was an unforgettable way to go. Better than a five star hotel. My fiancé and I loved it. My dog Bijou thought he was at home with the park across the street. It was spot on in terms of location. The church also gave me a sense of home, sometimes you need that when you are away especially on a Sunday. The accommodations were beyond my expectations. Sure it looked good in the pictures, but how many of theses advertisements really deliver true to form. Your company nailed it. When ever we return to Savannah, you will be the first if not the only place on our to stay list. I have visited Savannah for over ten years, it is my favorite city to explore. Love the vacation rental idea, so much more flexible than hotels. The Sycamore rental is a good location for walking around the historical area. Parking is not available in front of rental. Metered parking one block away. Place was immaculate. Spiral staircase may be a problem for some. We could not get our suitcases up the stairs but did not matter because their is no closet in bedroom. Our biggest obstacle was the air conditioner. It was unseasonably warm and place was very hot when we arrived. No thermostat or instructions for air. Had to call for service, thank goodness they arrived within an hour. Perhaps if instructions were posted for AC and dehumidifier this could have been avoided. Throughout stay upstairs was comfortable while downstairs was ok. So with a small wall mounted air conditioner upstairs only, no closet or hooks for hanging clothes, no counter space in bathroom,I will not stay or recommend the Sycamore Carriage House. As always Miss Wilkes is the best for Southern Comfort Food, The Gyphon is a great lunch spot. We enjoyed our First Squares Food Tour and free ferry boat to the Westin Hotel. Thank you for choosing to stay with Lucky Savannah. We sincerely apologize for the inconveniences experienced on this visit. We thank you for bringing this to our attention, and we are now having instructions placed in the home, explaining how to use the AC/Heating unit. We are glad to hear you enjoyed your time exploring the beautiful city of Savannah. We enjoyed staying at this cute getaway. The spiral staircase was our only issue. It was really tiny. But other than that we loved it!!! Great space in a great location. Almost the entire historic district is within an easy walk. A bit difficult to find initially, the directions provided are okay, but could be more clear. The entrance is located in the middle of the alley (Jones Ln). It appears that the space was recently finished. There are a few minor finish issues that could be addressed. But overall, absolutely amazing. Thank you for choosing to stay with us! We appreciate the feed back, and the kind/honest review! We are so happy to hear you enjoyed the location! We hope to have you as our guests again in the near future! We had a wonderful time staying the the sycamore carriage house. We were surprised of house spacious it was. Loved the location. Just a block and beautiful walk away from Clary's for breakfast. My only suggestion to the staff is to make sure you give people the code for the alley door which was different then the code for our front door. We had to wait about 15 minutes outside the door in order to get in. The staff did call me back and sent a handyman to open it because they were unsure of the code as well. Remember, there are two codes for this property. Thank you for choosing to stay with Lucky Savannah! We are so thrilled to hear you all had a wonderful time at the Sycamore Carriage House. We are glad you also enjoyed the beautiful location of the home as well! We do apologize for the code(s) not being available. We are glad to hear our maintenance team was able to head over to resolve this. We hope to have you as our guests again, in the near future! Don't forget about 10% "Returning Guest" discount. We loved our stay here. It was within walking distance to many beautiful sites and restaurants. The house was beautiful and exceptionally clean. I loved being surrounded by history. The bed was comfortable and the neighborhood was quiet. On a small note, if you're cold natured like I am, you may want to bring an electric throw blanket. While upstairs (bedroom and bath) stayed warm, the downstairs area stayed a little chilly. My husband was comfortable, but like I said, I'm cold natured so. I was happy I had my heated throw. We loved our stay here and hope to return. Also loved the fact that we could bring our dog. Savannah is an extremely dog friendly city. Thank you for choosing to stay with Lucky Savannah! We are thrilled to hear you enjoyed the location of Sycamore Carriage House. We are so glad you found the home to be beautiful and clean! We agree, Savannah is a very dog friendly city. Our team hopes to have you all back in Savannah soon. We attended the Music Festival and found the location perfect. The neighborhood is quiet and quaint. We will keep this property on our list of perfect places. I would only make 1 suggestion. Put a mat at the door. We were there when it was raining and thankfully I had a old towel in the back of our car that I could put down. The floors are beautiful and even though we took our shoes off, the floor was getting dirty. Thank you for choosing to stay with Lucky Savannah! Sycamore Carriage is a great place to stay here in Savannah. This home is located in a quiet, and quaint neighborhood indeed! We will definitely take that suggestion into consideration. Lucky Savannah hopes to have you all again soon! This apartment is adorable, cozy and adorable. It is important to note that the stairs going upstairs to the bedroom are small and winding, as in watch your steps. But this very tastefully decorated apartment is one I will use again without hesitation. Hi Rudy! Thank you so much again for choosing to stay with us. We're so glad to hear you enjoyed Sycamore Carriage House and our beautiful city. Jones Street is certainly a site to see, and we're so happy you were humbled to be staying there. Please know you're privy to our Friends and Family discount next time you stay with us, and we look forward to hosting you again soon. I had a wonderful stay in the little carriage house on Jones Ln. It was a perfect home away from home as I enjoyed exploring Savannah! I would definitely recommend staying here if you would like to walk the beautiful streets, relax in the lovely squares, and enjoy nearby shops and restaurants. 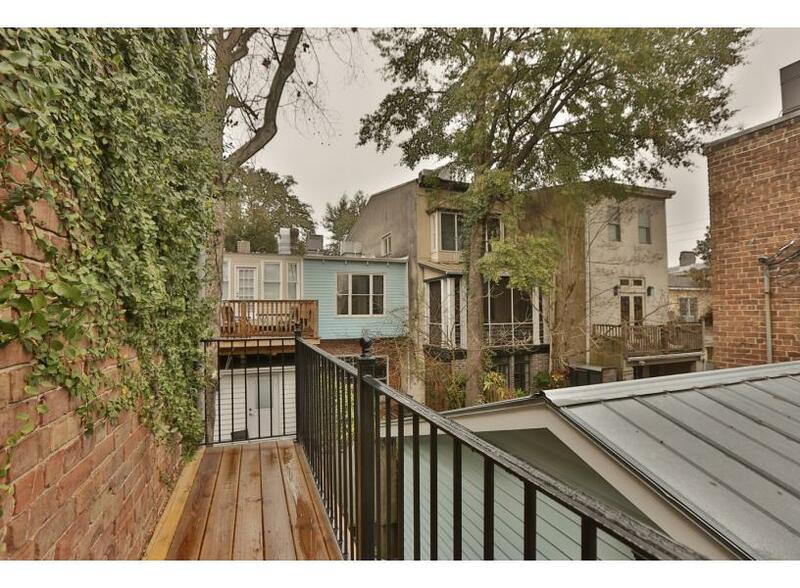 It is in a great location just on the other side of the elegant East Jones Street. It rained a couple days during my visit, and I was so glad that when I wasn't out in the city I had a peaceful and well decorated place to sit and drink tea and read a novel! It perfectly fit the mood I was in during my Savannah adventures...Apart from a little rain leaking near the fireplace my last night and a little confusion with heating and cooling the apartment, everything was just right! A perfect place for me as I ended days filled with fun memories in Savannah- the Hostess to the South! Hi Miranda! Thank you so much for choosing to stay with us at Sycamore Carriage House. We're so happy to hear that this home perfectly fit the mood of your Savannah adventures, and hope you'll stay with us again soon! My wife and wanted a nice place to rent and get away from it all, just the two of us. The rental was adequate. The apartment was cozy, clean and had everything we needed. When I arrived I could not get into the unit because I was entering the wrong combo. I contacted service and I was assisted immediately . I enjoyed it and recommend it. Hi Robert! Thank you for staying at Sycamore Carriage House. We do apologize for the minor code issue but are glad to hear that you enjoyed your time in Savannah. Please know you're privy to a Return Guest Discount next time you're in town! Loved staying in the historic district. We could walk everywhere!The carriage house was cozy and nice. 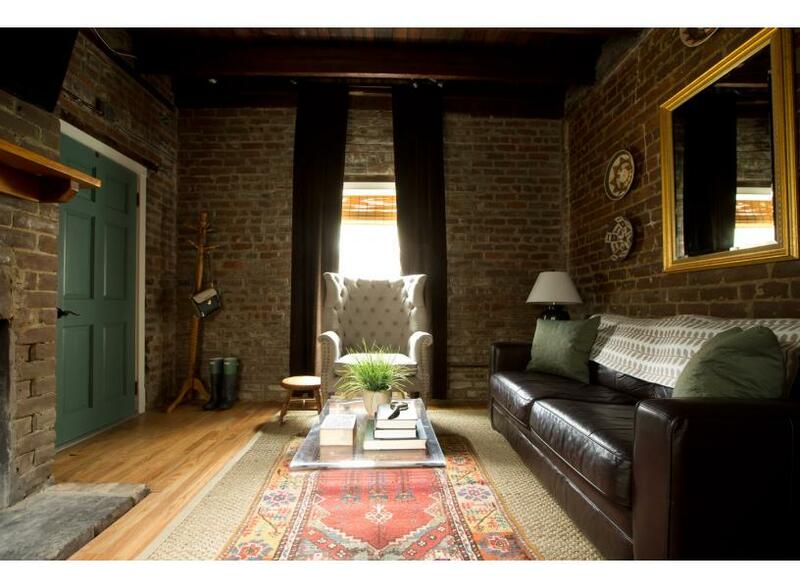 Love the old brick and the old fireplaces. It was nice to have a mini fridge and microwave. The only negatives were that we couldn't use the fireplaces; the heating/cooling vent/fan was very noisy; and the the pillows were awful. Invest in better pillows! Overall we enjoyed our stay very much and we would rent the carriage house again. Hi Kathy! Thank you for staying at Sycamore Carriage House. We're so appreciate of your suggestions and do hope you'll stay with us again soon! When we first arrived we were very pleased. The location was great and the inside was fantastic. We then went up stairs to change and back down stairs to relax. While it was 90+ degree's outside it felt like it was about 80+ inside. I was sweating sitting on the couch. I called the customer help line and it took about a day to get the situation resolved. I was not happy with the initial issue because our stay was two day; however, customer care handled it very well. They provided an additional downstairs A/C unit. They were extremely friendly. I appreciate how the situation was handled. Other than that issue, it was great. Thank you again for staying at our Sycamore Carriage House, Joshua. We do apologize again for the temporary A/C issue, and thank you for being patient while we resolved the issue as quickly as possible. Please know you're privy to a Return Guest Discount next time you stay with us. We stayed here for our honeymoon and really had a great time. Great location, lots of sights within walking distance, also good availability of on street parking. Kitchen was good for us, just the right amount of utensils and dishes. Quiet location, we never had any issues with noise or traffic. Would definitely recommend this properly to others. Thank you again for staying with us for your honeymoon, Bradley! We look forward to hosting you again soon. Our rental experience was overall very good. There were two details that did limit our enjoyment of the rental. First, we reserved the space for three people, but when we arrived (later in the evening, after hours to call the office, we thought), there were no sheets, blankets or pillows for the sleeper sofa downstairs. Fortunately, we had an air mattress in the car just in case, but if we hadn't, the third person would have had nowhere to sleep. Second, the whole unit was very warm when we arrived (both stories). Through the weekend, the upstairs cooled to a comfortable enough temperature, but the downstairs room remained too warm to sit in comfortably throughout the weekend. The unit has only one air conditioner, and another needs to be installed to make the downstairs room habitable in the summer. Honestly, we were sweating if we sat on the couch down there for any period of time. The space was beautiful and historic, and excellent location, so I think with some adjustments by Lucky Savannah these issues could be easily amended! Hi Fay! Thank you again for staying at Sycamore Carriage. We're so happy to hear that you had a good experience during your ladies getaway. Please don't hesitate to contact our 24/7 Guest Services line should we have overlooked anything upon arrival. A quick call would have had those sleeper linens delivered promptly. Please know you're privy to a Return Guest Discount next time you're in town! Great location, cute decor! Spiral stairs are awesome! Bed wasn't the most comfortable but overall perfect stay!